The Department of Public Management offers two graduate certificate programs – Nonprofit Management and Planning & Economic Development. Each certificate program is comprised of four graduate courses, for a total of 12 credit hours. These certificate programs are a perfect complement to students completing graduate degrees in other areas or for students who have already earned a bachelor’s degree but who are looking to augment their professional skills in one of these certificate areas. All Graduate Certificate students will be required to be admitted as graduate students. The application procedures, regulations, and policies given in the master’s degree section apply to all certificate students (except for the required letters of recommendation). The time limit for completing the certificate program is three years from the term of entry. All information regarding course requirements for the certificate programs can be found in the University Catalog. The Graduate Certificate in Planning and Economic Development is intended to provide a credential for students preparing for careers in the public, private, or third sectors requiring familiarity with planning and economic development concepts and methods. This certificate is not intended as a substitute for a professional degree in planning, but as an opportunity to supplement another graduate degree. The certificate will provide courses covering planning theory, planning methods and urban and regional theory, plus an opportunity to select electives in a single substantive planning specialization such as economic development planning, health planning, transportation planning, environmental planning or land use planning. The certificate program in Nonprofit Management and Social Enterprise has two focuses. First, it will cover the skills in management, economic decision making, marketing, fundraising, and financial management that graduates can use (but which they are unlikely to get on the job) in any part of the nonprofit sector: social service provision, education, health, the arts, the environment, international relief, or religion. 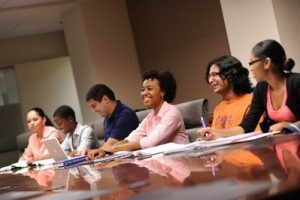 Second, while most nonprofit management certificates have an exclusively practitioner focus, the Georgia State program will prepare students interested in pursuing nonprofit studies within graduate programs in Public Administration, Policy Analysis, or Economics. This certificate will serve two main groups of professionals: those currently in the nonprofit sector who want to acquire new skills or need a credential to advance professionally, and those outside the sector wishing to enter. Many professionals in the nonprofit sector seek to improve their skills in ways not available through on-the-job training, such as those in strategic management, leadership theories, and managerial economics. As the nonprofit section “professionalizes,” there is an increasing demand from employees currently in the sector for a credential that lies between in-house training programs and actual academic degrees. The third sector’s rise in importance in the local and national economies is indicative of a net movement of labor out of government and the private sector and into nonprofit organizations. Sector-changing employees provide a constant source of demand for the skills and credentials appropriate for such a switch. Students completing the Graduate Certificate in Nonprofit Management and Social Enterprise may also be interested in joining The Nonprofit Leadership Alliance. The Nonprofit Leadership Alliance is a national student organization that prepares undergraduate and graduate students to become competent, well-rounded nonprofit professionals upon graduation. After meeting all of the requirements for NLA, students will earn a national certification as a Nonprofit Professional. Please note that this certificate is conferred by the national Nonprofit Leadership Alliance organization, not Georgia State University; therefore it will not appear on official transcripts or diplomas from the university. For more information on the Nonprofit Leadership Alliance chapter here at Georgia State, visit the NLA website. The Department of Public Management offers two graduate certificate programs – Nonprofit Management and Planning & Economic Development. Each certificate program is comprised of four graduate courses, for a total of 12 credit hours. These certificate programs are a perfect complement to students completing graduate degrees in other areas or for students who have already earned a bachelor’s degree but who is looking to augment their professional skills in one of these certificate areas. To request a certificate be awarded, students must apply to graduate.